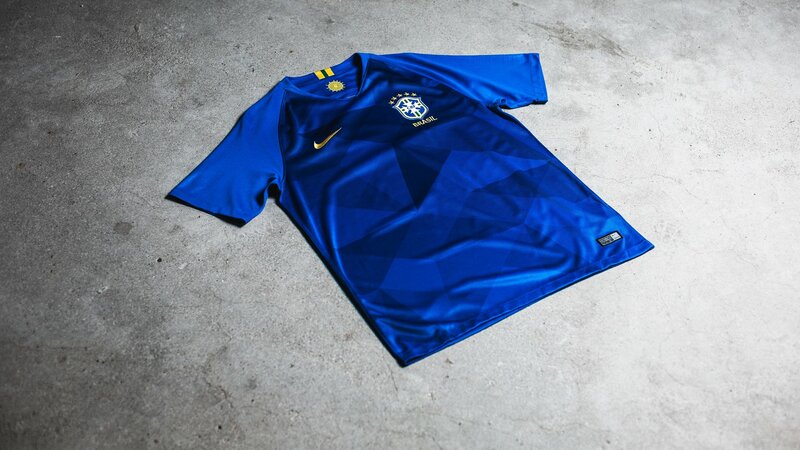 Nike freshens up the Brazil Away Shirt. Read more about the new Away Shirt for the 2018 World Cup! With the release of the Home shirt, we also got the Brazil Away Shirt. The Away Shirt is made with the same mindset as the Home Shirt, and is based on the same design, keeping the shirt close to its history and traditions. Do you want to learn more about the new Brazil Away Kit? Then let’s get to it! Nike hasn’t gone too far away from the roots of the Brazil Home and Away shirt. Both are kept close to their history and tradition, with a little twist that gives a fresher look. We took you through the Home Shirt, and the Brazil Away Shirt is build on the same design. Nike sticks to the blue based colour, while having yellow details on the Nike Swoosh, crest and stars. A knitted pattern, in lighter and darker shades of blue, has been added to the shirt. The pattern gives a nice visual boost, making the shirt even nicer to look at! Want to see and read more about the Brazil Home Shirt? Then read more right her! Nike has also added a star graphic pattern on the front and back of the shirt. This can have a relation towards the five stars above the crest, which indicates that they have won the World Cup five times and keeping a red thread throughout the design of the shirt. While speaking of details, Nike has also placed three stripes on the collar, which are yellow and green, keeping a close connection to the Home Kit and the Brazilian crest. Furthermore, the Seleção pride crest is also placed in the neck as seen on the Home Shirt. The following lines are taken from the Brazilian Manifesto, and you can sense that Nike has taken inspiration from it. Nike keeps the Away Shirt close to its history and traditions, and this lies close to the Brazilian DNA and way of being. The stars on the shirt relate to their World Cup wins, keeping them in mind of how to play football the Brazilian way, and the sixth sense that the Brazilians have while playing football. Want to get your own Brazil Away Shirt? Then buy it here when it gets available!